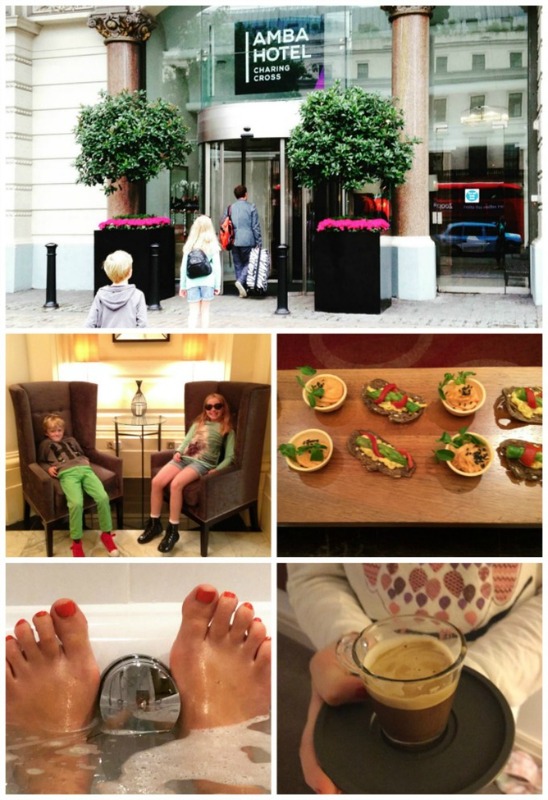 When Helen took her family to a show in London’s famous West End, she decided to make the most of the weekend by staying overnight, and avoiding the late-night train trip home. The Amba Hotel in Charing Cross was the obvious location, right on the Strand, and a short walk from most of London’s theatres. But would it tick all the boxes for the varying needs of a family? Amba Hotels is the new alias for a couple of the iconic Thistle Hotels of old. 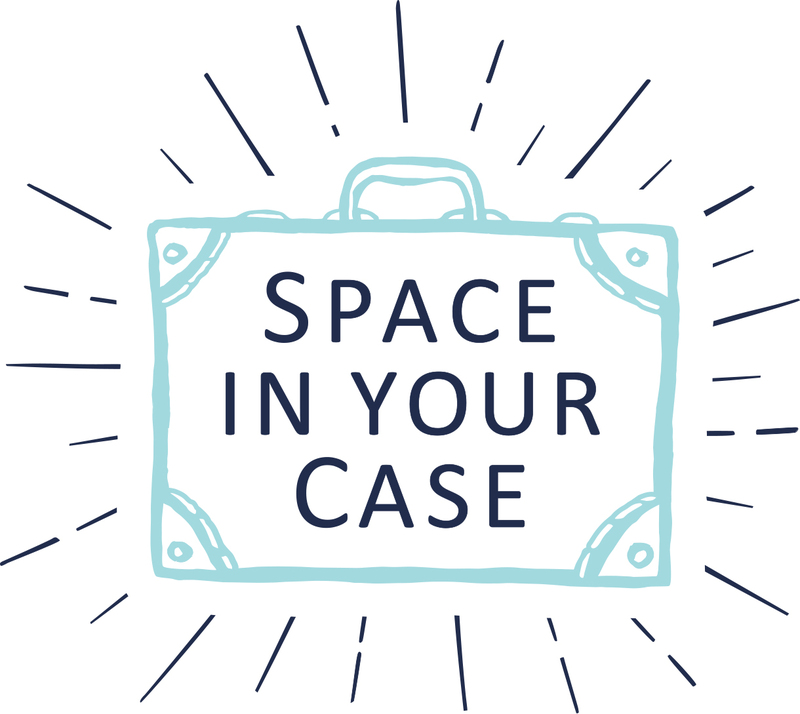 Situated in the heart of London, they’re large buildings, with lots of rooms, but you’d never know that from the personal feel you get the minute you walk through the doors. 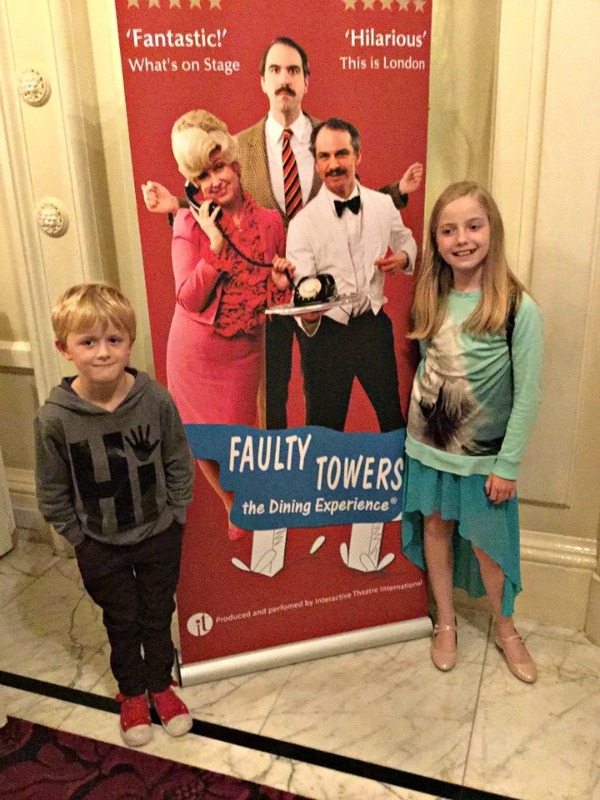 I’d booked tickets for my family to see Faulty Towers the Dining Experience (and yes, you should go, it’s brilliant. Read a review of our experience here.) and rather than trek home, I booked the hotel which hosts the show so we could head straight off to bed afterwards. At the time, I didn’t realise that the Amba Hotel was going to be way more than a bed for the night! The hotel is situated at one end of the marvellous building that is Charing Cross station. It looks tiny in comparison to one of the busiest train stations in the Capital. And when you walk through the doors, there is still no evidence of the grandeur of the building. Instead, it has the rather glamorous, sophisticated feel of a boutique hotel, and the service touches impressed us right from the start. As I checked us in, the children were offered water and juice, and the friendliest staff I’ve ever met set to answering all our questions – about the hotel, the area, and what we could get up to while we were there. NB. if you arrive after 5pm on a Saturday, a Prosecco will be offered alongside the juice! It was only as we made our way to our family suite that we began to realise what a stunning Grade II listed building this is, with sweeping staircases and long hallways. That said, the team at Amba have managed to create a very modern, personal feel to every room, and we were delighted to discover a very comfortable sofa-bed for the children, and a huge super-kingsize bed for us, complete with Hypnos mattresses. The first time I slept on a Hypnos I was eight months pregnant, and hadn’t slept properly for weeks. I went straight out the next day and ordered one for our own bed – that’s how comfortable these are! As I languished in a very deep, very long bath (is it only me who gets annoyed by having to choose which bit of me to leave out of the water – knees or toes? No such dilemma in an Amba hotel.) the kids settled down on ‘their’ sofa to flick through the channels on the largest TV screen I’ve ever seen. There was the added bonus of crisps and fizzy water from the complimentary mini-bar that Amba have installed in every room. Us adults were further thrilled to see usb charging points all over the room, and so we all quickly lost an hour in relaxation. Sitting at the Trafalgar Square end of the Strand the Amba Hotel Charing Cross is a perfect base for whatever you might have planned for your stay in London, and indeed, we did make the most of our weekend, visiting the South Bank, Covent Garden, Leicester Square’s Ripley’s Believe it or Not!, China Town, and the shops of Regent and Oxford Streets. And if your feet get tired of pounding the pavement, the children always love a ride on the top of a London bus – you can get pretty much anywhere from the bus stop right outside the hotel. But our plan was to take the Duck Tour for the afternoon, so we headed down to the London Eye for ninety minutes of fun and education. 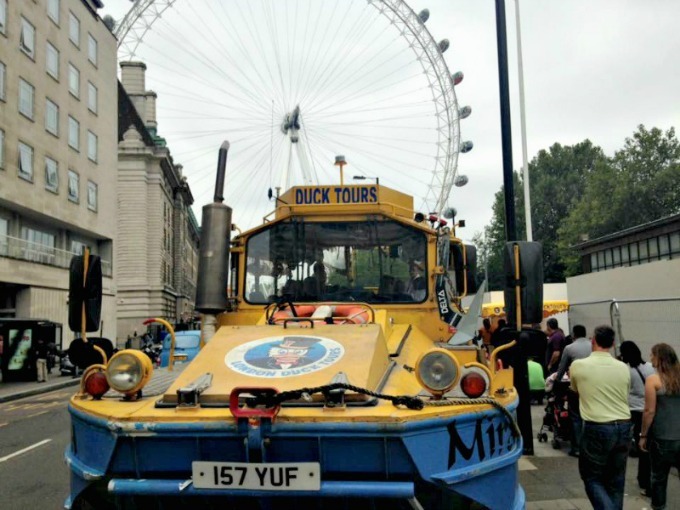 If you haven’t tried the Duck Tours, it’s well worth it – we’d never been that close the water on the Thames, and you do feel like a tiny speck amongst the bigger boats, but it’s so much fun, and there’s nothing the guides don’t have an answer for (whether it’s all true or not)! What we needed after a long day out in London was a bit of pampering, so after a waterfall shower in our lovely bathroom, we headed down to the Amba Lounge. For guests in an executive room, your keycard grants you access to a private bar, where you can sink into sumptuous sofas and indulge in gorgeous appetizers, accompanied by a glass of wine. Or a diet Coke if you’re under the age of 18! It was just what we wanted to set us up for our evening of fun with Basil, Sybill and Manuel. This is where the size of the building comes into its own; the show is situated upstairs, in two of the very grand function rooms with separate kitchens – perfect for dinner with the Fawlty’s! After a brilliant evening, we were too excited to sleep, so we all piled into the huge bed to catch up on X Factor news on our (almost) cinema sized TV screen. The Nespresso machines: every room has a Nespresso coffee maker. A small luxury, maybe, but one of those things that marks a hotel out as meaning business where luxury is concerned. The dining room: overlooking the Strand, it’s the perfect place to fill up on gorgeous pastries, fresh fruit, and perfect poached eggs in the morning. The bric-a-brac: the hallways boast old-fashioned telephone boxes, post boxes, and very cool mirrors. Every corner-turn brings another little addition to add colour to your stay. The staff: every member of staff we encountered was not just friendly, but really took the time to make their service personal. And nothing was too much trouble. When we returned sore-footed from five hours in New Look (don’t ask – tween girl shopping) they were only too happy to pour us a drink and let us sit for a while, despite the fact that we’d already checked out. Amba also have the Marble Arch hotel opening shortly (Autumn 2015), which will place visitors just off Oxford Street, and some of London’s most famous shopping haunts.